3 Reasons Why You Need a VO Accountability Partner – via Dave Courvoisier – Learn the benefits of an honest relationship with a trusted colleague and how to select the right person for you. Is Your Portfolio Demonstrating the Best You? – via Natasha Marchewka – Are you highlighting the full breadth of your abilities on your ACX profile, your website, and elsewhere? Natasha’s got tips to make the most out of your promotional real estate. Submit Your Book to Holiday Gift Guides – via The Book Designer – Getting your audiobook listed in a book guide can be a great way to expose your work to tons of potential listeners. Note that you needn’t wait for the year-end holidays to take action on this tip. What Your Brand Needs – via CreateSpace – What’s the one simple trick that will make your author brand more interesting to your fans? CreateSpace’s Richard Ridley offers his answer. Stop Talking for a Better Voice – via Dr. Ann Utterback – This counterintuitive advice makes sense once you read when you’re recommended to abstain from speaking. Voiceovers And The New Tax Code – vi Tom Dheere – If you have questions about how the new tax code will affect your VO business, Tom’s got you covered. Part two can be read here. ‘Talk British To Me!’ … A Desirable Talent For Voice Actors – Here’s What To Practice – via Voice-Over Xtra – Add another accent to your repertoire with this advice from VO Sarah Mitchell. How to Build Your Brand in 2018 – via CreateSpace – Author Richard Ridey has three quick tips to improve your promotions in 2018. Jump-Start Your Writing: 3 Myths That Hinder Creativity—and How to Conquer Them – via Writer’s Digest – If you’re battling writer’s block, it may be time to unlearn some of the less helpful pieces of wisdom you’ve come to believe. 10 Critical Author Marketing Lessons We Can Learn from Apple – via where writers win – From keeping it simple to developing an aura of mystery, this fun infographic has a number of helpful ideas. Masterful Narrative Scenes in Novel – via C.S.Lakin – The more compelling the book, the more appealing it will be to narrator and listeners alike. All year long, we’ve been sharing audiobook production, publishing, and marketing links from around the web. Today, we’ve gathered your favorites from the past year, along with a look at the creators who published them. Read on for some great advice, and you just might find your new favorite site to bookmark. Karen Commins is an Audible Approved ACX Producer, and has been a professional voiceover talent since 1999. She’s produced and recorded over 50 titles in her custom-built home studio, in addition to writing articles on audiobook production and publishing on her blog. Dave Courvoisier is a voice actor, blogger and Emmy-winning TV news anchor. His blog features a variety of topics for VO’s, and his experience in the industry makes them worth your attention. Are You a PROFESSIONAL Voice Actor? Yes, You Can….But SHOULD You? Paul Strikwerda is a Dutch-English voiceover pro, coach, and writer. His lengthy posts are often philosophical in nature, and tackle VO theory more than specific technical advice. Dr. Ann Utterback is a voice specialist with more than 40 years experience working with broadcasters, voice over artists and podcasters around the world. Her blog is a great place to learn how to take care of your instrument. ALLi is the Alliance of Independent Authors, a non-profit professional association for authors who self-publish. Their blog focuses on teaching publishing and marketing skills to authors who don’t have the backing of a major publisher. BookMarketingBuzzBlog is written by Brian Feinblum, a veteran of two decades in the industry of book publishing publicity and marketing. On his blog, you’ll discover savvy but entertaining insights on book marketing, public relations, branding, and advertising. Do You Market Your Book With Urgency? Our partners in publishing, CreateSpace is the one stop shop for your print on demand needs. Their blog features bite-sized pieces of publishing and marketing wisdom, with a bit of beginner’s slant. Hi! This is Brendan from the ACX QA Team. I’m here today to introduce our Reference Sample Pack, a new tool we’ve developed to illustrate how your audiobook should—and should not—sound during the various stages of production. This tool will help you spot problems in your audio and give you an idea of the audio quality your listeners will be expecting from productions on Audible. We’ve also included files that can be used to calibrate your Digital Audio Workstation (DAW) for recording. Mastering level specifications, especially RMS, can be difficult to understand via text alone. What better way to learn what kind of audio “passes” ACX QA than to have passable files at hand for you to refer to and test on your own setup? To use the Reference Sample Pack, download the zip file onto your computer. Unzip this folder and you will find nine WAV files that can be loaded into your DAW of choice. We processed, and in some cases distorted, the same raw file for each example, then divided the samples into two categories: files that can be used as good production targets, and files containing issues you should try to avoid. Start with our PDF guide, which contains exact details on what you should listen for while playing. This file has a few issues that need to be resolved before it can pass QA, the mouse clicks and excessive spacing at the start of the file for example, but nothing you hear can’t be resolved during the editing and mastering stages. This next file contains the same performance, edited properly. Notice the edits made between “Step 1” and “Step 2.” We trimmed the spacing (circled in purple) at the top of the file to half a second, and removed the mouse clicks and deep intake breaths (circled in yellow), replacing them with clean room tone. Learning proper editing techniques can take some time, but I’ve found that the Alex the Audio Scientist blog post on editing and spacing is a helpful starting point. I even use the same QC sheet referenced in Alex’s post when I work on my own projects. Files with Peak or RMS levels that do not meet our requirements. You should not use these files to calibrate your system for recording. Rather, train your ears to notice these sounds as you work on your own files, and use these examples to understand the most common issues you may run into during production. The sample pack also includes the script used during the recording of the samples. If you are testing out your levels before you begin a new project and want to compare your recordings to the “target” files in this pack, we recommend you use this script, which can be found on the last page of the file “ACX—Sample Guide.pdf.” Record your read of the script and compare your noise floor and peak level to the “Step 2” file. The closer you can get to matching the samples, the more confident you can be that you will pass QA inspection later on in the process. It can be easy to get caught up in post-production, using too many plugins or tools when trying to meet specifications, or trying to fix poorly recorded audio that is beyond repair. At ACX, we believe the best time to address audio issues is before they make their way onto your recording. Training your ears to know when problems are occurring will be far more beneficial than having the latest noise removal or EQ plugins will ever be. The better you get at listening to yourself, the better your productions will sound to others. Did you find the QA Team’s Reference Sample Pack helpful? Tell us in the comments below. How Ordinary Authors Can Promote a Book Like a Great Author – via BookMarketingBuzzBlog – The difference between an “ordinary” author and a “great” author is often a simple change in your perspective. Find out how to elevate your attitude to get to great. 10 Critical Author Marketing Lessons We Can Learn from Apple – via where writers win – This handy infographic should give you some ideas for ways to successfully market your audiobook. 20 Best Songs for Writers and About Writing: The Ultimate Writing Mixtape – via Writers Digest – Set the tone in your writer’s room with this snappy mix of literary-focused tunes. The Turning Point – via Paul Strikwerda – Are you working towards you own success, or just hoping good things will happen to you? Don’t Let a Cold Wreck Your Holiday or Your Voice – via Dr. Ann Utterback – Crowds and confined spaces are breeding grounds for cold-causing germs. Learn how to combat them this holiday season, and spare yourself the literal headache of missed workdays. Audiobook Advice from Hall of Fame Narrators – via ACX – Learn from your peers as they share their reflections on a successful career in audiobook narration. It’s that time of year again. While you’re prepping for Halloween, we’re prepping for the upcoming December audiobook sales season. For the best chance for your book to be on sale in time for the 2017 holidays, we recommend your titles are approved and submitted to ACX by Friday, December 1, 2017. Please also ensure your audiobook meets all of our Audio Submission Requirements before submitting, as your title may be delayed going on-sale if our QA team needs to reach out to you with questions. Watch our recent video on passing ACX QA, then check out our favorite links from the past week below. Study Peter Coyote’s Compelling Narration In Ken Burns’ ‘The Vietnam War’ PBS Series – via Voice-Over Xtra – Listening to the narrator’s documentary and contrasting it against his audiobook performance can be an enlightening exercise. The One Surefire Way to Find New Clients – via Dave Courvoisier – CourVO offers a surprisingly simple directive, for those willing to put in the effort. The Agony Of Ignorance – via Paul Strikwerda – Read Paul’s advice for achieving “unconscious competence,” and why it’s better in the long run not to get spoon-fed easy answers. Book Promotion: Do This, Not That – October 2017 – via The Book Designer – Instead of hoping your friends will leave glowing reviews of your (audio)book, learn how to earn reviews from motivated readers and listeners. Using Physicality to Bring Your Characters (And Your Fiction) to Life – via Writer’s Digest – Add this one to the “give your narrator something awesome to say” folder. 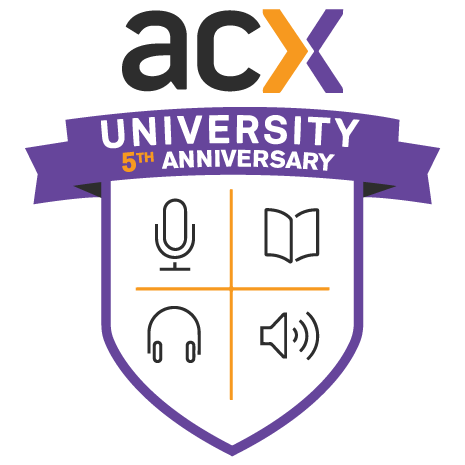 Yesterday, we wrapped up the 2017 semester of ACX University. This year’s event featured audiobook production, publishing, and marketing advice for ACX authors and actors. We broadcast enlightening conversations with bestselling authors, Audible Approved Producers, and the top minds from ACX and Audible Studios. You can watch all episodes below, and subscribe to our YouTube channel to get notified about future ACX videos. Performance Perfection: Go Behind the Mic – via ACX – In this episode, Sarah Mollo – Christensen performs passages and receive corrections from award-winning director Kat Lambrix. How to Pass ACX QA Every Time! – via ACX – In this episode, David and Brendan from the ACX QA team discuss editing, mastering, and spacing issues, causes and treatments for each issue, and some fixes for after the fact. Ahead of the Curve: Prospecting for Pros – via ACX – Audible Approved Producers Steven Jay Cohen and Neil Hellegers share their secrets for how to maximize their profit and time by finding great projects both on and off the ACX platform. Beyond the Booth: Monetizing Your Voice – via ACX – Join us for a discussion featuring Andi Arndt and Carin Gilfry on how conferences, voiceover coaching, and performance awards can help you boost your bottom line. Peace, Love, & Understanding Your Audio Partner – via ACX – Join us as we talk to publishing duo Piers Platt and James Fouhey, an author and narrator who’ve created eight audiobooks together. The Life of an Audiobook Publisher – via ACX – Follow bestseller Kym Grosso through the process of creating an audiobook from scratch, all the way to completing the finished audiobook. If You Market, They Will Listen: Marketing 101 – via ACX – In this session featuring bestselling author Lauren Blakely and author marketing consultant Kate Tilton, you’ll learn audiobook-specific marketing tactics to attract reviews and sell more copies. The Elements of a Well-Reviewed Audiobook – via ACX – Paul Stokes of AudiobookReviewer.com and Robin Whitten of AudioFile Magazine discuss how they choose which audiobooks make their listen lists. From the performance to the cover art, they’ll share how to improve your submission and improve your chances of receiving reader and professional reviews.